Time to sell your Eden condo? Read about today's resort-market condo buyer. 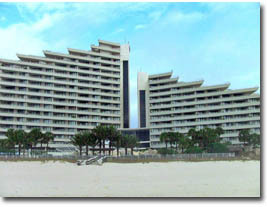 Eden condominium is one of the most easily recognized developments along the beaches of Perdido Key due to its sheer size and unique architecture. The developers of Eden were inspired by the luxurious resorts of the French Riviera and thus created a magnificent condominium surrounded by lush gardens, tropical landscaping, and a beachside pool oasis with flowing waterfalls. A short stroll down Eden's private boardwalk brings you to Perdido Key's famous sugar white beaches and emerald waters. Eden offers two gulf-front pools, a heated indoor pool, hot tubs, meeting spaces, business center, state-of-the-art gym, spa services, and more. Don't forget your boat! Spend the day at Robinson's Island or cruise around Old River using Eden's dock which holds 24 boat slips. Fitness buffs have full access to the resort's health club with modern gym equipment, his & hers saunas, and steam rooms. Wind down your day and treat yourself to a hot stone massage or custom facial at the day spa. All residences at Eden feature well-appointed finishes and are available in one-, two-, or three-bedroom floor layouts ranging from 1,060 to 2,160 square feet. With plenty to offer, come and find out why Eden has been home to so many over the years. Aside from the amenities, Eden is located in a great area of Perdido Key close to numerous dining and shopping establishments. Less than 10 minutes away is Orange Beach AL offering a great selection of family-friendly attractions and entertainment options. Please let us know if you would like further info for Eden or any other condos, homes, or real estate along the Gulf Coast or would like to schedule a private viewing by emailing info@condoinvestment.com or by calling 251-Area-Pro (251-273-2776) for immediate assistance. These numbers are low, but take a second and read these RENTAL TIPS. Find annual rental incomes for Beach Colony Resort and all other Perdido Key condos.